So a new volume of papers in now online that I have edited and now there’s lots of pterosaur goodness to access. This is above titled volume produced by the Geological Society and is volume 455 in the Lyell Collection. The full list of papers and links is here but while most have been available online for some time, there is not this pretty published hardbacked version (cover art and photo by Mark Witton). This volume is ultimately the product of the 2015 Flugsaurier meeting held in Portsmouth and features a number of papers that were presented there as well as others that have come in. There is a new taxon named (an anuroganthid!) and papers on taxonomy, systematics, anatomy, ecology, ontogeny and biomechanics. There are 17 papers and an introduction and as such I think it’s fair to say that this is a major collection and anyone with a serious interest in pterosaurs is going to need to read this. Sadly the collection is not OA and these volumes can be expensive, but they are generally available at a reduced rate after a year or so. Unlike earlier editions the individual papers have been produced as high quality PDFs and distributed to authors, so if there’s a particular paper you are desperate for, I’m sure you can enquire. Personally I like dead tree versions of things, and this volume is printed on nice paper and has nice colour figures too which is clearly a bonus. I should take a moment to thank Mark Witton and Dave Martill my coeditors in this venture and all the referees who took time to work on these papers. Also I’d like to thank the staff of the Geological Society who accepted our pitch and helped guide us through the work necessary to get this volume completed. I’m very pleased with the finla result and it’s nice to see citations already accruing for the papers within. The books are bing printed and shipped so for anyone who has ordered or was an author on a paper, expect these to arrive in the next few weeks. David, how much is the printed volume and where do I go to purchase one if I wanted one? Also, what does “OA” mean? OA is ‘Open Access’. The Geological Society website should have an order form but I don’t know how much it will be I’m afraid. Congratulations! I’m wondering, have you ever taken a look at the Delaware pterosaur material? It’s mid-Campanian in age, and a pretty decent size cervical vert found there is oddly short and compact. Not seen it, sorry. Not even aware of it directly (there’s lots of bits in lots of places). Has it been described in a paper? Yes, in Baird and Galton (1981). 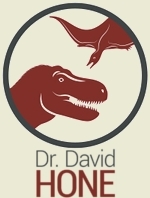 This site (http://www.newjerseypaleo.com/bibliography/biblioB#TOC-Baird-D-P.M.-Galton-1981—Pterosaur-Bones-from-Delaware-) has a pdf of the paper if you’re interested. Congrats again! That doesn’t ring any bells when I see it, but it does look like a reasonable diagnosis as an ornithocheirid. Also, thansk for the PDF link.